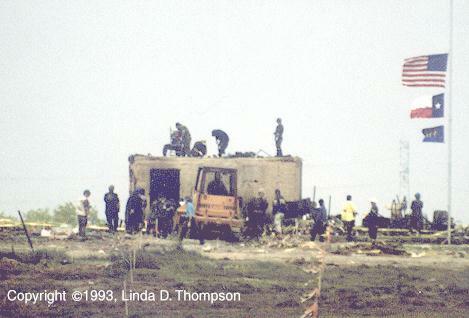 The "bunker" (so-called by the government and the media) was a concrete room before the Davidians occupied the land. The Davidians incorporated the structure into the first floor of the Mt. Carmel Center, and here it is shown after the rest of the Center was destroyed by fire. The structure could not be used as a bunker: it had no firing positions, would provide no advantage in a firefight, and was completely enclosed in the wooden structure of the Center, which would block the sight of any approaching enemy; simply stated, it could never serve as a bunker. The Davidians used it for food and (apparently) ammunition storage. The Department of Justice Report, the Autopsy Reports of the Torrent County Medical Examiner's Office, at least one Branch Davidian survivor, and the popular press say that many of the women and children died in the concrete room when it collapsed. On April 30, 1993, the Waco Tribune-Herald told the world that the "bunker" collapsed, killing some of the women and children inside. The ammunition caught fire in the concrete room, incinerating the bodies. The above scenario is a composite drawn from the following sources: Dr. Nizam Peerwani and Dr. Rodney Crow of the Tarrant County medical examiner's office, the official Autopsy Reports written by that office, the Department of Justice Report, and the account of Branch Davidian David Thibodeau. Their stories will be examined as the Museum tour proceeds, to see if the evidence corroborates the account. Secondary sources, such as newspapers, repeated the story of the "collapse" with exaggerated detail. For example, The Washington Post, July 20, 1995 (cached). The Bunker. A concrete room near the complex's cafeteria. More than 40 Branch Davidians died inside or near the bunker on April 19, 1993, apparently while seeking a fireproof haven. Tons of concrete collapsed, burying, crushing and suffocating about 13 people. Investigators say vibrations from the dozen tanks on the scene or falling fire debris — or both — contributed to the bunker's collapse. The story of the "collapsed bunker" is now a part of the common (and fake) knowledge of the Waco Holocaust.